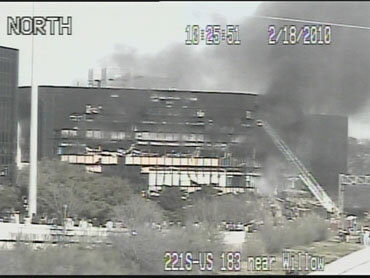 AUSTIN, Texas (CBS/AP) Black smoke billowed out of a Texas office complex Thursday after a small aircraft reportedly crashed into the seven-story building. The FBI has an office in the complex, although not in the building that was struck. Fire crews in Austin rushed to put the fire out and witnesses told CBS affiliate KEYE that they saw a small explosion just after the crash. Dawn Clopton, a division chief with the Austin Fire Department, says two people from the building are unaccounted for. She says it was a small private plane that crashed. 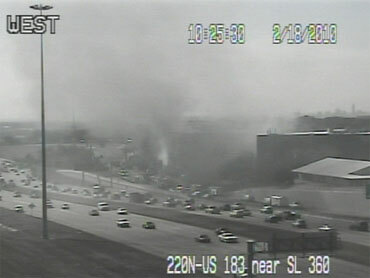 The building is located at the junction of Highway 183 and Loop 360 a major highway in Austin. Reports that the complex also housed a small field office for the FBI were confirmed by FBI spokesperson Eric Vasas, who told CBS News that the FBI office is in the complex, but not in the building that was hit. An official at the Department of Homeland Security told CBS News "At this time, we have no reason to believe there is a nexus to criminal or terrorist activity." The FBI has said that they are not investigating the crash but are assisting the Austin Police Department in their investigation. Paramedics have set up a triage center at the scene, though it is unclear how many people are injured.